Vince Thompson sings songs of experience in a resonant, baritone voice. 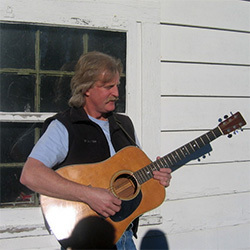 He has been influenced by the lean, truthful lyrics of Merle Haggard and the sweet melodies of Hank Williams, along with the rhythms of jazz and rock & roll, His own compositions are written from the perspective of a man who, after growing up in California, traveled far from home for months at a time, over many years as a deck officer aboard large ships. In his performances, Vince includes up-tempo tunes and ballads, original compositions and songs of others. Listeners will hear the impact of country and bluegrass in his music, along with an assured, smooth style, pointing to the influence of jazz and swing. Together with some of the finest musicians in New England, Vince plays music that sounds good and makes you feel something. The typical lineup includes Vince on rhythm guitar and vocals with upright bass, drums and electric guitar…and lately pedal steel.